Yep, we are under a winter storm warning till tomorrow night. Can you say EXCITED! This is one thing this southern girl loves about living in PA. I am still hoping to see a foot or more at one time this winter. Maybe tomorrow will be the day. A and I plan on staying all warm and cozy snuggled inside in our jammies and enjoying the day. Plus we get to babysit our wonderful litle 5 month old neighbor for a few hours while her daddy goes to work and he mama is out of town. She is such a joy! Totally get my baby fix! A seems to really be having some breakthroughs in regards to reading. Everyday I find out that she can read even more words then I thought. Tonight she read Daddy another bedtime story (she and I take turns reading a book to Daddy everynight) and she had never seen this book before and did AMAZING. She read words I did not know she knew. She's not even 3! Where is she picking this stuff up?! 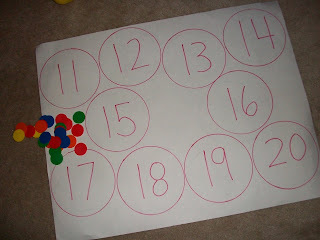 So this week we have been working on recognizing our numbers 11-20. I made this math game for her. She reads the number and then counts out that many chips into the circles. She's got these down now, except for occassionaly calling fifteen five-teen LOL. So tonight I am making a board for 21-30. That's what A call's this game. 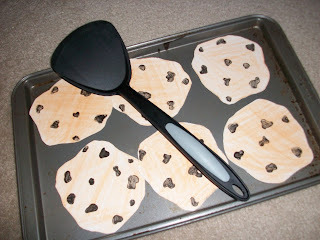 I simply cut out cookie shapes, colored them, and on the back wrote words on the back. She uses a spatula to flip them over and then reads the words on the back. 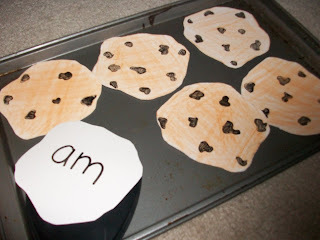 Later this week we have a book we are making about cookies that uses the words from our game. I threw in some words that I knew she knew to help build her confidence when approaching the new words. It seems to have worked. After 3 times of playing the game, she recognizes all the words, even out of context. So overall, it's been a pretty fun week so far. LET IT SNOW!